This recipe I am going to share with you is actually pretty easy. It requires nothing more than a few ingredients, a bowl, a wooden spoon and some excitement! Most of us, when we hear multigrain bread, we think it will take hours and hours slaving away in the kitchen to make a single loaf. So not true. This is my own recipe that I created(adapted from another recipe, and so on and so on. just like any other recipe....adapted) for a light and hearty multi- grain free form loaf bread. It is actually pretty simple. It is GREAT with marmalade's, jams, honeys and even used for a nice turkey sandwich. Take all the dry ingredients and mix it together in a 5 qrt lidded bowl. Just not air tight. Add the water and mix with either a wooden spoon, your hands, or a stand mixer. But DO NOT KNEAD the dough. Once all the flour is incorporated. Check to see if it is a nice sticky,wet dough. You might need to add a tablespoon extra of water to insure that it is nice and wet. let rise for 2-3 hours at room temp. You can either use the dough after the rise or put it in the fridge. The dough will store up to 10 days in the fridge. On baking day, take a 1.5 pound piece of dough and shape into a elongated loaf. Sprinkle some cornmeal onto a pizza peel, and place the loaf onto the cornmeal. If dough is cold, let rest for 2 hours. If dough is at room temp, rest for 1 hour. Place pizza stone or silicone mat on center shelf of oven with a broiler try under neath the stone or mat. pre-heat oven to 450. Slash the loaf with 1/4 inch slashes across the top, side to side. 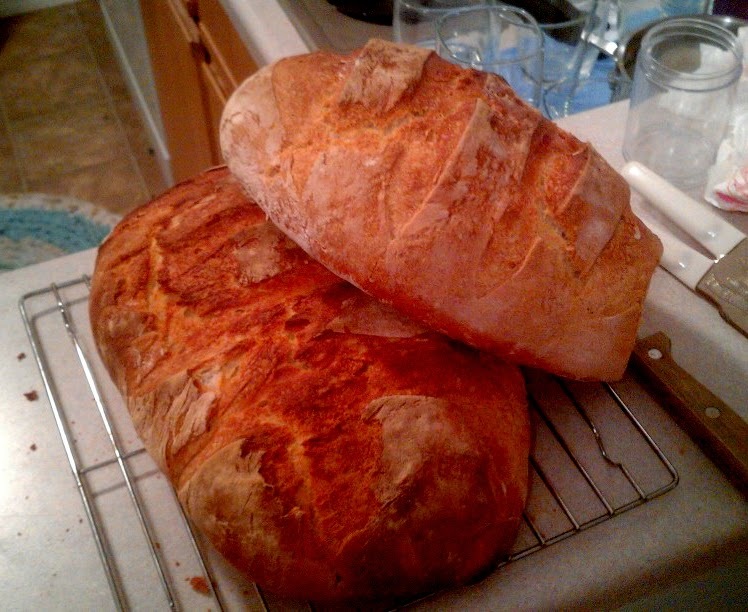 Place loaf on stone or mat and pour 1 cup of hot water into the broiler try. DO NOT USE A GLASS TRY.. Bake for 35 minutes or until nice and golden brown. Let completely cool on wire rack.